You know you Fight Like a Girl! Now, make it official! 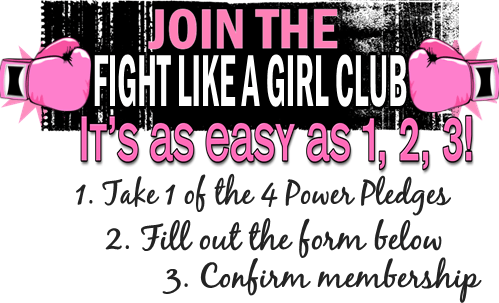 Take the Power Pledge, fill out the form, and become an official member of the Fight Like a Girl Club! NOTE: You will be given an opportunity to purchase a membership kit for $2.00 but please note that you do NOT have to purchase this kit for your official membership to be valid. We do not make a profit off of the membership kits. Choose the Power Pledge that fits you best. After clicking on one of the choices, the appropriate Power Pledge will appear. As a Fight Like a Girl Club member and because I matter, I promise to stand strong in my fight against the health adversary that forced itself into my life. I recognize that there is a Power within me that has always been there. I am aware of this Power, I accept this Power, and I claim this Power. I am confident that by claiming this Power I will prevail. Because I care, I will share my experiences, both good and bad, with others going through similar struggles either through The Fight Like a Girl Club or any other place that I may be able to offer my assistance and compassion. I recognize that there may be times when I struggle and am tempted to quit. I will not feel guilty for these moments of uncertainty, for I am human, but I also will not dwell on them. During these times, I will remember my family, my friends, my Fight Like A Girl Club comrades, and others who love me and turn to them for assurance and support until I am back on my feet again. I will Fight Like a Girl and I will win. I CAN do this. I WILL do this because… I CLAIM MY POWER! As a Fight Like a Girl Club member and because I matter, I promise to stand strong in the fight against the health adversary that, at one time, tried to overtake me. I recognize and I am grateful that there is a Power within me that rose to the occasion, fought, and ultimately, defeated this opponent. I acknowledge that there may be times when I have concerns about it returning. I will not feel guilty for these moments of uncertainty, for I am human, but I also will not dwell on them. During these times, I will remember the Power within me and I will KNOW that this same Power can and will keep this opponent from ever touching me again. 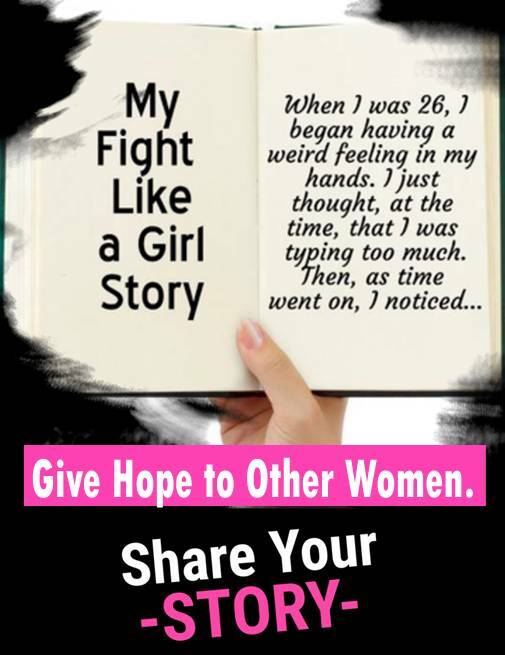 I will share my experiences, both good and bad, with others who are still fighting either through The Fight Like a Girl Club or any other place that I may be able to offer my assistance and compassion. I will Fight Like a Girl for my continued health and for all who are affected by cancer and disease. I will fight strong and I will make a difference because… I CLAIM MY POWER! As a Fight Like a Girl Club member and because I care, I promise to stand strong with my loved one in her fight against the health adversary that forced itself into her life. I will support her and fight strong for her until she wins. I will listen when she needs to talk, I will hug her when she needs to be held, I will cheer her on when she needs support. I will laugh with her, cry with her, and always, always be there for her. I recognize that she is human and that there may be times when she struggles and is tempted to quit. During these times, I will offer my assistance and compassion and remind her of all who love her and reassure her until she is back on her feet again. I will Fight Like a Girl for this special person in my life and I will make a difference for her because… I CLAIM MY POWER! I don't personally know of anyone Fighting Like a Girl but I want to join the Fight and make a difference! As a Fight Like a Girl Club member and because I care, I promise to stand strong in the fight against cancer and other life-threatening diseases. I will, whenever possible, support those who are ‘in the fight’ and do what I can to promote awareness, advocate the cure, educate myself and others, and participate in support organizations, such as the Fight Like a Girl Club. I will fight for every cancer/disease warrior – that they win their fight. I will fight for my children and their children and their children – that their futures are cancer and disease free. I will fight for myself – that I remain healthy as I grow older. I will stand strong, and I will Fight Like a Girl because… I CLAIM MY POWER! 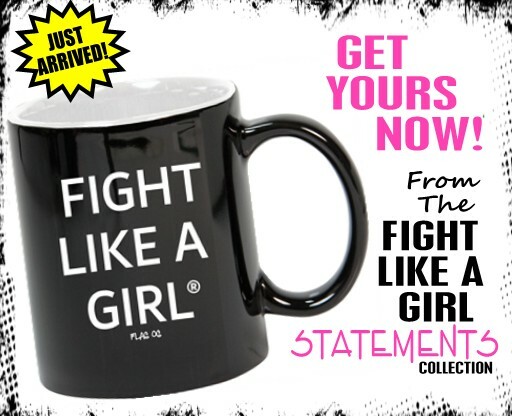 Click here to confirm that you have taken the Fight Like A Girl Club Power Pledge. I Fight Like a Girl For Myself! I Fought Like a Girl and Won! I Fight Like a Girl For Someone I Love! Yes, send me the Fight Like A Girl Club newsletter and occasional updates. No, I do not want to receive communications from the Fight Like A Girl Club.